Heat oven to 350°F. Generously spray 13x9-inch (3-quart) baking dish with cooking spray. In 8-inch skillet, melt butter over medium heat. Cook onions in butter 2 to 3 minutes, stirring occasionally, until tender. In large bowl, mix eggs and milk until blended. Stir in cooked onions, potatoes, ham and asparagus. Pour into baking dish. Top with cheese. Bake 30 to 35 minutes or until set. Season to taste with salt and pepper. This casserole can be covered and refrigerated up to 24 hours before baking. Uncover; bake 40 to 45 minutes or until set. 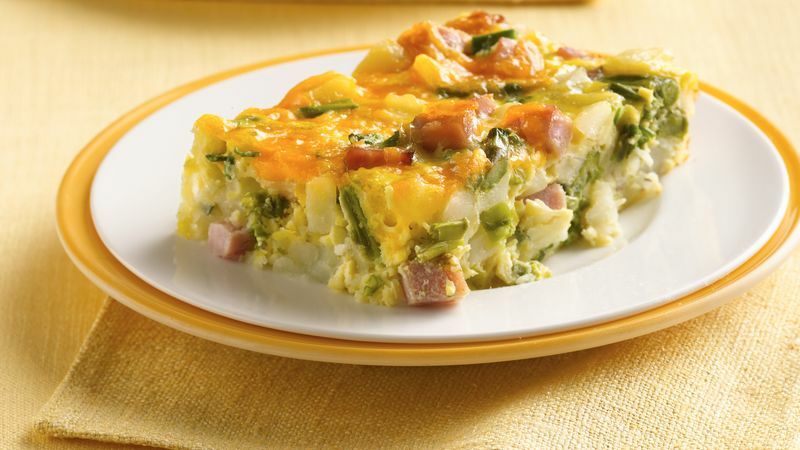 Two cartons (8 oz each) fat-free egg product (2 cups) can be substituted for the 8 eggs. One-eighth of the recipe will yield 220 calories with 8 grams of fat per serving.